I am a huge believer in inspiration boards. Being a visual person, they provide me with a great way of organising my thoughts and formulating the look and feel that I am after They also sometimes wind up being a work of art unto themselves! I have compiled inspiration boards for my own home and for my business and I have even engaged my kids in putting together boards for their dream bedrooms. 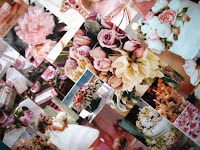 I love this image below of a wedding inspiration board. Just gorgeous. My Australian Vogue Living magazine finally arrived for September/October. I hated knowing it was out, but that I didn't yet have my mits on it! My favorite article is about New Yorker Diane Bergeron and her amazing home in Melbourne Australia, which is also a showroom for her exclusive imported fabrics. Just check out HER inspiration boards! I am also in love with her use of drapery to cover the wall behind her desk. So dramatic!